On April 30, 1932, the very first Yaddo Festival of Contemporary Music began in Saratoga Springs, NY. Works programmed that year included Aaron Copland's Piano Variations as well as piano works by Roger Sessions, Henry Brant, Vivian Fine and Roy Harris, songs by Charles Ives and Paul Bowles, string quartets by Marc Blitzstein and Louis Gruenberg, and a suite for unaccompanied flute by Wallingford Riegger. On April 29, 1969, Duke Ellington was invited to the White House to receive the Presidential Medal of Freedom on his 70th birthday. At the event, U.S. President Richard Nixon played "Happy Birthday" on the piano accompanied by the Duke Ellington Orchestra. On April 28, 2003, Apple Computer launched its iTunes Music Store and sold 1 million songs in its first week. On this day in 1667, the poet John Milton (books by this author) sold the copyright for his masterpiece, Paradise Lost, for 10 pounds. Milton had championed the cause of Oliver Cromwell and the Parliament over the king during the English Civil War, and published a series of radical pamphlets in support of such things as Puritanism, freedom of the press, divorce on the basis of incompatibility, and the execution of King Charles I. With the overthrow of the monarchy and the creation of the Commonwealth, Milton was named Secretary of Foreign Tongues, and though he eventually lost his eyesight, he was able to carry out his duties with the help of aides like fellow poet Andrew Marvell. On April 26, 1965, Charles Ives's Fourth Symphony, which was composed mostly between 1910 and 1916, is given its first complete performance by the American Symphony Orchestra led by Leopold Stokowski and two assistant conductors. Archguitarist Jon Mendle recently released his first CD, entitled L'Infidele after a lute sonata of the same name by the master baroque lutenist Sylvius Leopold Weiss (1687-1750). This release, from Brooklyn's In A Circle Records and produced by the great Sergio Assad, showcases Mendle's incredible artistry and deep musicianship through the interesting dichotomy of playing ancient music on an instrument invented only in 1980, by guitarist/lutenist Peter Blanchette. The archguitar is an eleven-stringed instrument that looks rather like a mutant classical guitar. According to Mendle's website, "the Archguitar is a hybrid of the Renaissance and Baroque lutes, 19th century guitar, and modern guitar, making it ideal for a large cross section of early music, as well as certain modern and impressionist works." On to the CD however; it contains Mendle's own transcriptions of the Weiss lute sonata as well as one by Adam Falckenhagen (1697-1761) and CPE Bach's Prussian Sonata V which was originally written for clavier. The CD opens with the deep and weighty Largo at the head of the Falckenhagen sonata. In the subsequent Allegro un Poco Mendle's technique is revealed in the fantastic roulades and turns that he throws out in a manner sounding seamless and almost effortless, which is as it should be, the ornamentation feeling like a perfectly natural and unobtrusive outgrowth of the musical stuff whence it came. The finale contains a mischievous recurring staccato theme that Mendle draws out insightfully and plays with obvious delight. The CPE Bach is redolent with nascent classicism, and Mendle's playing makes the distinction between this style and the High Baroque of Weiss and Falckenhagen very clear. Again the fantastically difficult ornaments, this time in the middle Andante, are all realized smoothly and yet not monochromatically, alternately bold and delicate as called for. 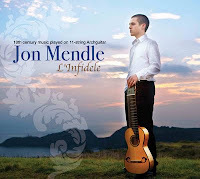 Throughout this CD the spectacular ornamentation is one commonality linking all of the compositions together; Mendle has a natural feel for it and isn't afraid to express himself through everything from filigreed and almost non-existent mordants to lengthy and substantive turns and doppelt-cadences. The Allegro Assai of this piece features voice-leadings taking off on various flights of fancy all their own. The L'Infidele sonata, really a baroque dance suite, finishes out the CD. The Entree was exquisite, the Courante danceable and pulsing, and the Menuet featured terraced dynamics that yielded a fetching echo effect. Mendle explores a wide variety of tone colors in this suite; saucy mezzo-staccato phrases give way to sere, almost harsh plucking and muted, other-worldly legatos. The grumbling drone strings in the Musette present yet another delight to be savored. If there were any flaw with this CD, it would only be that I wanted more after listening to it, and I immediately played it over from the beginning. Look for more great things to come from this brilliant emerging artist, who has already played with the likes of Yo Yo Ma and his teacher Sergio Assad. A couple of years ago, I interviewed Robin Goodwin Nordli, a veteran actor of the Oregon Shakespeare Festival, for an article that I wrote for the Oregon Arts Commission. I asked her if the actors had some sort of tenure at the festival. She replied that they did not have any tenure. Every actor has to reaudition every year. I know that some of the actors have purchased homes and raised families in the Ashland area. They are the ones that are good enough to keep getting roles at the Oregon Shakespeare Festival or they have to find a job somewhere in the community or maybe they got a few good gigs doing commercials or films in Hollywood and returned to the Ashland area. In any, case none of the actors at OSF have tenure. I raise this matter, because some people still seem unable to get over the fact that some longtime members of the Oregon Symphony lost their jobs. Orchestras are run differently than acting companies, and continuity of sound is an important thing to consider. You could try to reaudition all of an orchestra every year, but that would be maddening. As per the comment below, from the Oregon Symphony's principal violist, Charles Noble, that orchestra's musicians do have tenure. It is granted after a two-year probationary period. After tenure is granted, there is a formal process for non-renewal of a contract that must be followed for a musician to be dismissed. I had originally thought that none of the orchestra members had tenure and that any orchestra member can be replaced, abiding by the musician's contract and union rules. So, I stand corrected in that matter. Even though the Portland Symphonic Choir is not a full-time professional arts organization like the Oregon Symphony or the Oregon Shakespeare Festival, its members have to reaudition every two years. I think that this re-auditioning process helps to make the choir sound better. Holiday met Meeropol through a connection at a nightclub in Greenwich Village. She wanted to record the song, but her record label refused to produce something so graphic and she was forced to record it on an alternative jazz label. Holiday's recording of "Strange Fruit" is unique in American music for its unflinching look at one of the darkest periods in national history. OTO rolls out the red carpet at the Mission Theater on Friday, May 6 with a wild night of audience participation soap OPERA. 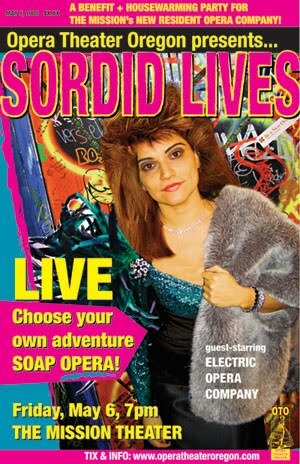 'Sordid Lives' borrows from '80s daytime television, tabloid journalism and the works of the great composers to create a truly demented, all-musical choose-your-own-story opera adventure. When Wall Street banker Archibald Shackles casts off his scheming first wife Amber for a younger man/woman/man, Amber will stop at nothing to get her revenge: not even framing Archibald's new squeeze for impregnating their daughter. But did he/she/he do it? And if not...who did? Two teams of opera singers and the OTO Technicolor Orchestra and Chorus battle it out at the audience’s command. Shrieking diva fights, hot, passionate clinches, evil twins, amnesia and intrigue abound! Special guest appearances by members of the Flash Choir and Electric Opera Company. ‘Sordid Lives’ is written by Pat Janowski (Livewire! ), Katie Taylor (OTO Producing Artistic Director), John Dover (Alien Baby), and a host of helpless dead composers who will probably be writhing in their graves. Electric Opera Company takes the stage at 9:00pm. Imagine 12 shredding Angus Youngs playing Rossini and Wagner, only cuter, and you’ve got the picture. ‘Sordid Lives’ is a benefit and housewarming party for OTO at the Mission Theater, where the company is now resident. Audience members will be invited to bid for their plot choices and participate in a raffle for fabulous prizes, with all proceeds benefitting OTO’s expanded programming at the Mission. The event is the culmination of a $10,000 fundraising drive to raise funds to help the company develop new performance and educational programming. This event is dedicated to the McMenamin brothers, with thanks for taking OTO on as a resident company. “McMenamins contacted us last year after our offer for the Guild Theatre fell through,” said OTO Producing Artistic Director Katie Taylor. “I can’t imagine a happier ending to that story!” OTO made headlines last summer for its lease offer on downtown’s Guild Theatre, dark since 2006 when the demolition of its restrooms put an end to NW Film Center’s residency there. The ambitious effort sparked the imaginations not just of film buffs and the Portland arts community, but of local architectural, engineering, construction and law firms who all offered pro bono services to bring the Guild back as a mid-sized live performance hall and retro movie house. OTO’s effort was ultimately unsuccessful, but it attracted the interest of brew pub king Mike McMenamin, who read about it in The Oregonian. McMenamin asked Corporate Music Director Jimi Biron to contact Taylor, and after several meetings and conversations, they came up with a plan for OTO to use the Mission Theater as its home venue and office. The Mission also houses the Film, Music, and Event booking departments for McMenamins. OTO’s plans for its residency at the Mission include a radio opera, movie musical sing-along nights with the planned OTO Community Choir, and the continuation of 'Sordid Lives' as a 12-episode online series. OTO’s mission is to bring opera back into pop culture through creative editing and adaptation. Affordable, entertaining, and commonly available—online, in movie theaters, at bars, OTO helps more people connect with classical music in ways that feel relevant to peoples’ lives. OTO is resident at the Mission Theater. Theater Oregon Technicolor Orchestra and Chorus. Special guests Electric Opera Company. Benefit and housewarming for OTO’s new residency at The Mission Theater. WHEN: Friday, May 6 - ONE NIGHT ONLY! "Teachers tend to form opinions about music, and these are always getting in the way of creation. The teacher, like the parent, must always have an answer for everything. If he doesn't he loses prestige. He must make up a story about music and stick to it. Nothing is more sterilizing." Virgil is right (to some degree), but this also describes the plight of a critic. One has to weigh the costs of writing criticism, and its value - in the end.